Zwilling J.A. Henckels International Forged Premio knives and cutlery are highly durable with extremely balanced blades. The elegant finish and stainless steel construction provides for a full tang handle. The comfortable ergonomic three-rivet design provides excellent balance. The metal end cap displays the Henckels International logo. 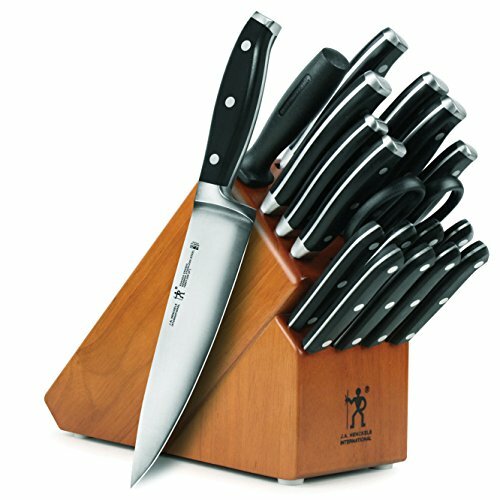 This particular set configuration offers an 18-slot knife block with an elegant Cherry finish and with all of the pieces included, the knife block will be full and complete. This set is a terrific value for those who want to take their cooking to the next level. Lifetime Warranty. If you have any questions about this product by Henckels, contact us by completing and submitting the form below. If you are looking for a specif part number, please include it with your message.